I want to pursue this idea of worlds changing, because when we think of these changes in conjunction with the changes that have to happen to us and our artefacts and ideas, to cope with the big changes, well, that’s a very fruitful place to be thinking. I want just talk a little about the impact of a previous world-changing event on humanity, to show how susceptible we are. 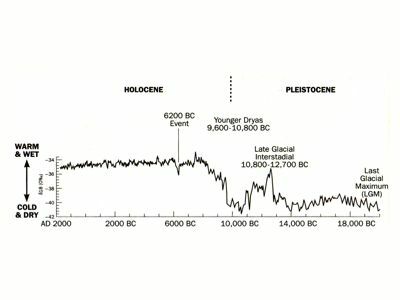 This graph is from page 12 Steven Mithen’s After the Ice, which isn’t sci-fi but instead a history of humanity from 20,000 to 5,000 BC. The graph shows how warm and wet it has been over the past 20 thousand years. In 12,700 BC, the last Ice Age ended. For a little less than 2000 years, it was almost as warm and wet as it is today. There were herds of gazelle over the Middle East. Nomads were settling in villages, and people were living in Europe. Then suddenly there was a 1000 years of drought and cold, caused by the North American ice sheets collapsing. Here’s an interesting way it changed. Where there was sedentary village life, we have found people decorated with imported seashells. There’s obvious wealth and power in the remains, with trade of course, and village elites. Because there are villages, that means there are controllable trade-routes and markets, which means the people who do the controlling become elites, and they create fashions and take the most valuable items. During the Younger Dryas, this dry and cold period, shells are still found, but they’re just discarded, and not buried as valuable things. People have moved out of the villages and now they trade with whoever they want, without having to go through an elite mediator. The shells have lost their artificial value. It makes me wonder what effect eBay will have, once trade gets really decentralised. Will wide-spread fashion vanish, when there’s nobody controlling the transactions? Or what controlling system will come up in its place?